Everyone knows that one person in life who has everything. You love them, you enjoy spending time with them, but buying gifts for them is a nightmare. Trust us when we say we’ve been there. When it comes to folks who lead to stressful shopping situations, the Magpies team has two words of advice: Gift certificates. After all, who doesn’t enjoy the freedom of picking out that just-right gift for themselves? 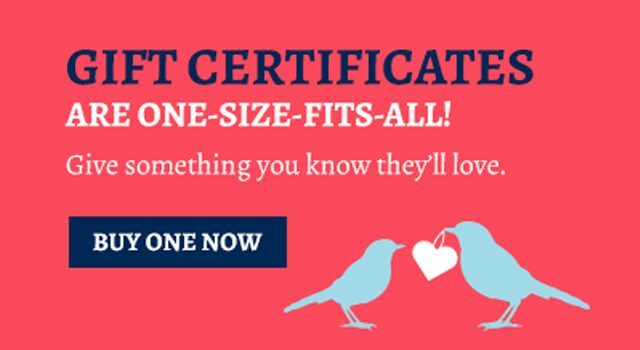 And we’re proud to announce that you can now purchase Magpies gift certificates online! How does it work? We’re glad you asked! We’ll give you the play-by-play right here. Visit our homepage and look for the large coral box that, conveniently enough, says “Gift Certificates” in bold letters. Click the “Buy One Now” box. In the pop-up window that appears, fill out the recipient’s name, and the card amount you’d like to purchase. Click “Add to Cart” and wait to be redirected to a PayPal payment page. Submit your order and VOILA! That’s it! An emailed receipt will arrive in your inbox, and a mailed gift certificate will go out to that lucky person on your shopping list. Simple, isn’t it? And awfully convenient! We’re excited to make this new option available to customers. A friendly bit of advice, however? We can’t accept PayPal receipts as payment at the register. The recipient will have to wait on the actual gift card to arrive in the mail. We know anticipation is tough, but good things come to those who wait, right? And we promise they won’t have to wait long! If you have questions about the gift certificate process, suggestions on ways we might improve it — or even just wanna say hello, we would love to chat. Stop by and see us at one of our shops, or get in touch here!